Mtn is doing everything possible to make their millions of subscribers happy. 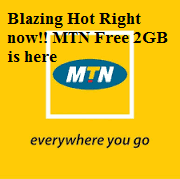 Just few hours ago, a New free plan activation code came on MTN, Called the MTN Blackberry VSF Plan which Gives Whooping sum of 2GB data to All Subscribers for Free. Or Dial *444#, reply 2, reply 4, reply 2 and reply 1. Change your IMEI to a Blackberry IMEI number and Start Rocking!, You May Use This Number 356760057287640 Or Tweak Last 3 Numbers. Simply tether your Pc from Your Phone thats all. How to Tether/Connect your Phone to Pc As Modem On YourComputer To Browse internet.